Bucky Raw is not as apologetic as he pretended to be when he first got deported to Liberia. When the artist was released from jail, he wrote a letter of apology to his kids, finace and female fans for the domestic violence rumors. During his first interview when he arrived in Liberia, he re-echoed this apology. 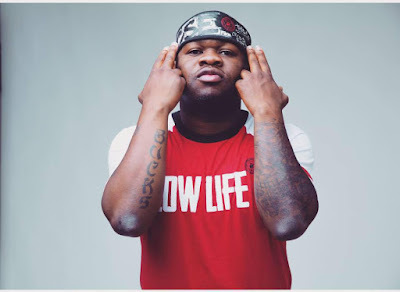 Well, the rapper did a 360 when he made a comment under a live video on Facebook. He wrote, "To be real y'all are the reason I got deported...all the lies y'all telling is the reason why I was arguing with my daughter's mom that got me in jail and deported. 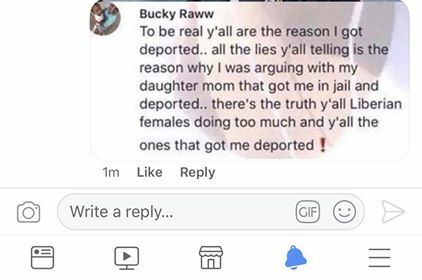 There's the truth y'all Liberian females doing too much and y'all the ones that got me deported." Check out his comment below. I don't see this as unapologetic OOoh, I think he trying to tell us the fans that there was some they say, and I say in his relationship. Don't blame anyone for ur fault. Take responsibility and learn from it. Without fans, you won't be where you're today. Hope you learn ur lesson. Let the man speak his mind. Social media is so intoxicating, like a virus,It Has effected most women. they no more live lives by being their true to Themselves but feed on the extreme feminism vibes (mostly outrageous and outta place) Setmons being preached everyday. I'm against domestic violence,That's for certain However, what we Liberians n world's females sees are the physical abused by the men But what about the verbal abuses n provocations? The mental abuse? Are they not domestic abuses also? The US y'all lived in with all those bogus rights, were only provoked a little by Iraq n they reacted with military actions, patience has limits, even God let loose his wrath upon this earth because of provocations.A man is provoked, they tell em, be nice, be a gentleman, when the same is done to a lady, they tell her to report to the police. What a gender bias. Most Liberian women are so unfaithful And provocative you'd wondered if they had any home training at all. There's also two sides to a coin. Buck was guilty but his lady is no saint in this matter Too,n you ladies who are corrupting Young Minds with your rhethorics better hold brakes, too many breakups, divorce because women think they're equal species like men...big lies, what God has created n sanctioned, no feminist woman or no man can undo.